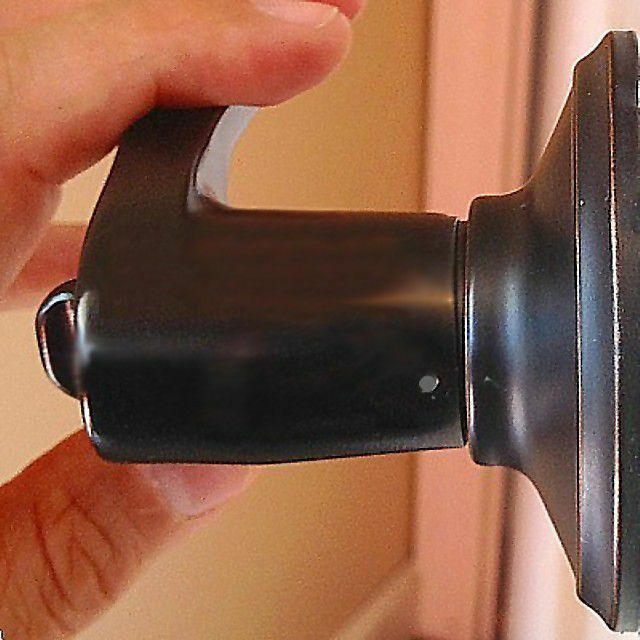 If you have a newer doorknob assembly on a door in your home that goes to the exterior, it will quickly become clear just how unclear removing that doorknob which has hidden screws can be to people. Unlike the oldest and most common method of attachment that uses exposed set-screws to fastened the doorknob to a threaded spindle, the screwless method is sleeker but can be a bit confusing. I outline the process for removing the lever handle for you in the tutorial Tighten a Loose Lever Doorknob. Unlike exposed screws on door hardware found on older homes, modern door hardware is clean looking, and consumers like the look of hardware that uses concealed screws to hold the lockset to the door. That's done by hiding the screws under a decorative cover plate which pops off, but getting the door knob off (or lever in this case) can be frustrating when there is no visible way to remove it. That's because modern door hardware uses a hidden mechanism called a detent to fasten the doorknob which can only be released using a small screwdriver tip or the end of a paper clip (depending on your style of hardware). The detent is a spring activated pin (concealed) or small thin plate attached to the spindle that protrudes into a doorknob notch which prevents rotation. The challenge with a hidden screw doorknob is depress the detent to release the doorknob from the spindle. How to do this is all spelled out in the tutorial so please take a read and see how you can fix one of life's annoying little problems.